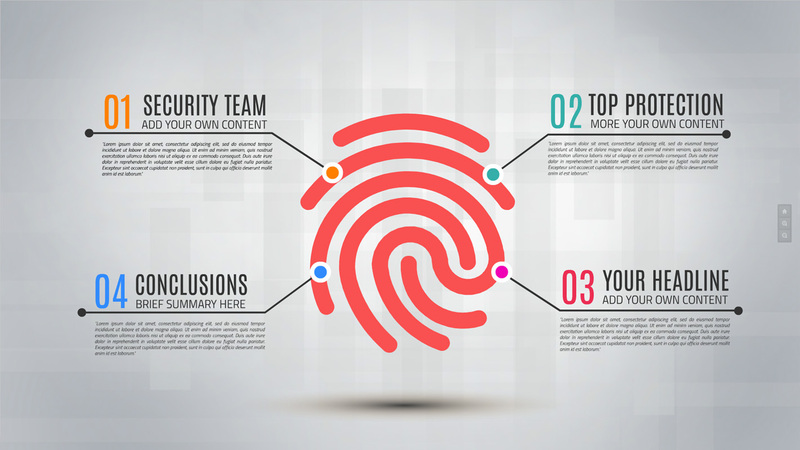 Prezi Presentation Template has a digital security system concept with big red thumb fingerprint for granting access to critical computer data. Big red thumbprint sensor and technology related light gray background. Recommended for technology and security related topics – surveillance, future sensors, safety, computer security, internet security, internet safety, digital security. Human accessibility by authorization with a biometric digital security system. Data protection, identity protection, digital signature, unlock a computer with fingerprint symbol. The futuristic topic for information technology by protecting data from strangers and criminals with biometric locking system. Add infographics, texts, headlines, titles, photos, videos to the presentation. It can inspire to make presentations about identity protection. Add infographics, texts, headlines, titles, photos, videos to the presentation. It can inspire to make presentations about identity protection. This entry was posted in Best Prezi presentation templates and tagged abstract, access, accessibility, authorization, background, biometric, code, communications, computer, concept, concepts, connection., crime, criminal, data, design, digital, digitally, display, enter, finger, fingermark, fingerprint, forensic, futuristic, gray background, hand, human, icon, identification, identity, image, imprint, information, inspiration, internet, key, mark, net, network, Order, pad, padlock, people, Pixelsmoothie, print, privacy, protection, safe, safeguard, safety, science, secrecy, secure, security, sensor, surveillance, Symbol, system, technology, template, thief, thumb, thumbprint, touch, touching, unlock, web.